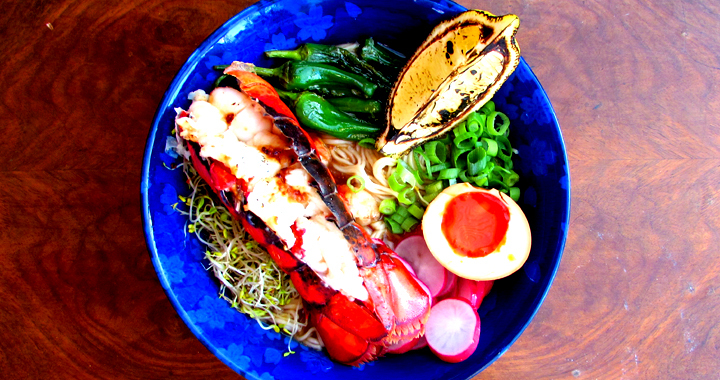 I have exclaimed many times my love of Shoryu Ramen and upon hearing that they created a collaborative menu with Sakagura, a recently opened Japanese restaurant and sake cellar in London, I was intrigued to see a spicy lobster ramen on their menu. I knew I had to try to make my own. This was combined with falling in love with two ingredients that I felt would make perfect additions to a ramen broth. The first being the smoky, umami undertones of chipotle soy sauce by Fun Soy. The second being an innocent looking little jar of Carrington’s hodge podge chilli oil. I used to be a bit addicted to the flavour of naga chillies, back when I could eat insanely hot foods and stirred Mr Naga chilli sauce into just about everything. The naga chilli has a unique flavour and is in this chilli oil, so it lends itself well to seasoning ramen. This chilli oil is very powerful and hot but works well for flavour in small doses! If you cannot get your hands on Carrington’s chilli hodge podge or Fun Soy chipotle, you can substitute any other chilli oil and soy sauce, but if can find these two ingredients they are well worth a try for the full effect here! Also, if you have a chef’s blowtorch, I highly recommend charring your lemon slices, as this will not only make it look attractive in the bowl but also really brings out the sweetness when squeezing over your lobster. Heat the oven to 180°c. Place the onion, ginger and garlic, unpeeled, on a tray and roast for 15 minutes. Removed, allow to cool and peel. Mix together the butter and miso for the miso butter and chill in the fridge. If it is not already done, use a very sharp knife to cut down the back of the lobster tail. Pull each side apart gently so you can reach your fingers through, under the meat, pulling it out and over the shell. It should still be attached at the very end of the tail. Place the fish and seafood heads/ shells in a large saucepan or wok and cover with a litre of water. Bring to the boil and add the onion, ginger and garlic, then add the konbu, mushrooms and dried chillies. Cook for 1-2 hours, removing scum if any should form. Remove any bits from the stock with a sieve or Chinese spider. Bring back to the boil and add the dashi powder. Reduce to a simmer and add the red and white miso, soy sauce and mirin. Keep warm while everything else is prepared. Heat your grill on high, place half of the butter on top of the meat of each tail. Cook under the grill for 5-7 minutes, until cooked through and the shells have turned bright red. Remove the lobster tails from the grill, removed the meat, slice into bite size pieces and return to the tail shell. Quickly fry the padron pepper in a little oil, sprinkled with a little sea salt and a squeeze of lemon until the skin is blistered. Prepare the noodles as per pack instructions. Drain and divide between two bowls. Pour over the spicy fish broth and top with all the toppings. Posted in Ramen Dishes, Recipes, Uncategorised and tagged Chilli, Lobster, Ramen, Seafood, Spicy.